Just a Girl and her KitchenAid: Cookies, Tarts and Pies! I found this recipe in Lorraine Pascale's Baking Made Easy and made it for my boyfriend's birthday, mainly to prove that I do listen to his baking requests! 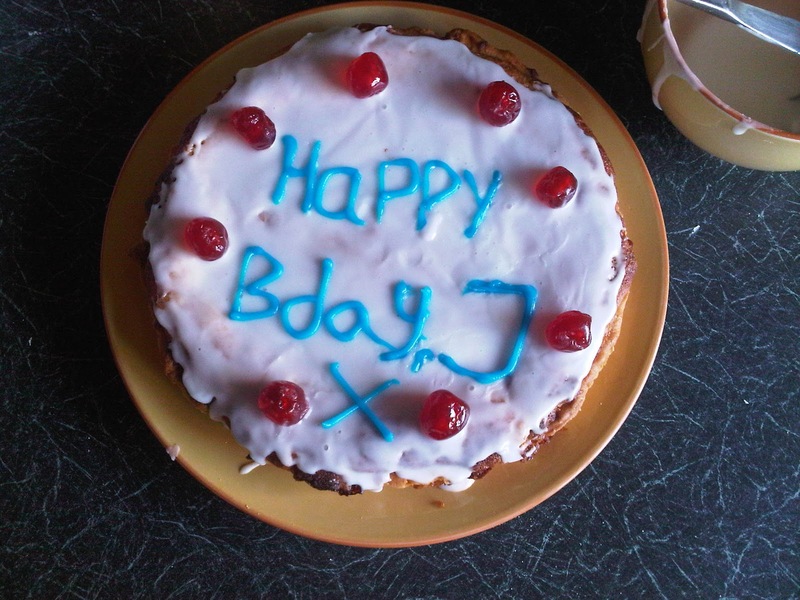 I don't like Bakewell Tart, or more to the point I don't like almonds so this may appear a pointless venture but it's my boyfriend's favourite and it was a big birthday! I decided to make two tarts (the best one going to my Grandfather to fatten him up) and by the time I made the second tart, I felt like a pro. 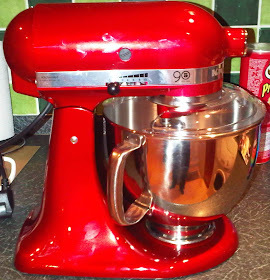 This of course is all down to Lorraine Pascale and her brilliant 'baking made easy' which allowed me to bung all the ingredients into the mixer and concentrate on my shop bought pastry. It was a bit of a faff mind and took a good 3 hours to make the two tarts, this was not helped by my refusal to taste the tart but I tried and it was very good indeed! 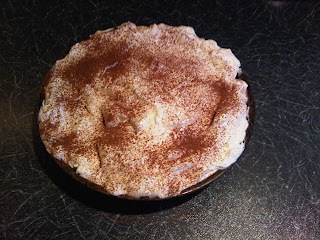 Banoffee Pie! Or tart? Who knows but who cares! What a beautiful invention! However every time I eat one I always remember why I don't like bananas. Certainly, after eating this I expected to feel like it would work better without the bananas but the recipe I used, again Lorraine Pascale, cooked the bananas in butter and vanilla essence and it added something to the taste of the pie which I actually quite enjoyed. I used whipping cream for this pie but felt that double cream would have provided a fuller flavour, the unhealthier the better! I also stupidly didn't make it in a loose bottomed tin and consequently struggled to get it out, much to my taste buds frustration! An easy peasy recipe all around, to be honest, and considering I've ruined 3 pans trying to make Dulce Leche, I went for Carnation's caramel in a tin. I'm such a pathetic cook!! 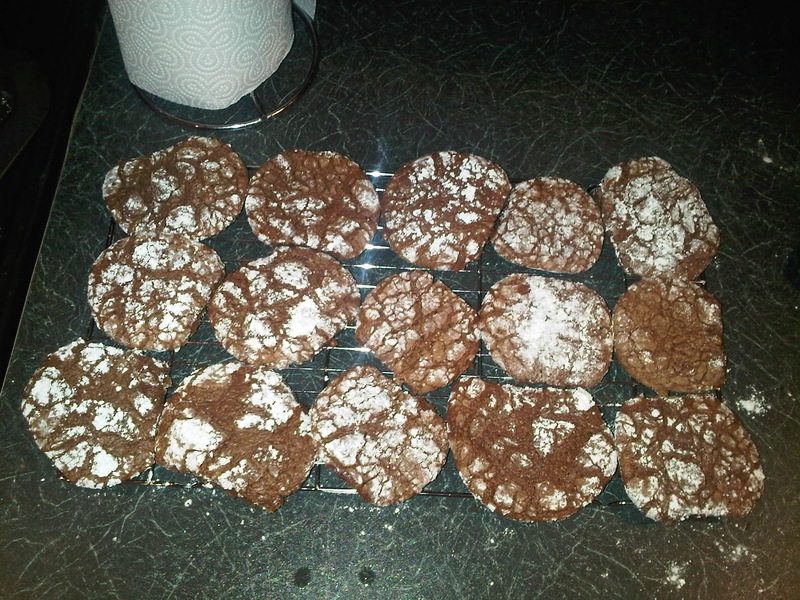 Chocolate Crinkle Cookies! I found this recipe on BBC Good Food last year and have never turned back. They are soo easy to make and have proper chocolate in them, not just cocoa powder like some other recipes I've come across. A tad faffy, you have to leave them in the fridge for an hour or two but this can be done for as long as you need, over night too if necessary. 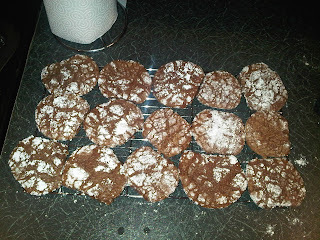 This also gives them their fantastic fudgey brownie texture, they are absolute bliss! The recipe says 60g of icing sugar is needed for the coating but I just tend to chuck some in a bowl and drop the dough balls in. A tip though, have COLD hands! Otherwise the dough just melts and it's an absolute mess. One adjustment I think I'll make next time is some chocolate chips, the cookies don't need any more flavour but I fell their texture is missing out somewhat. Go try them, now!